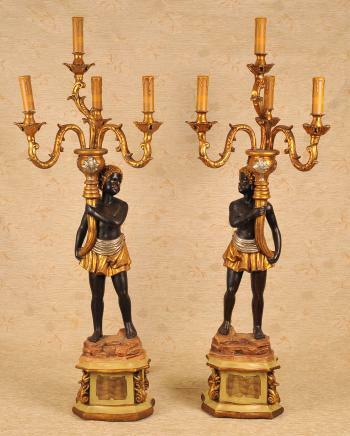 – Viewings possible in our Hertfordshire warehouse – please contact You are viewing a wonderful pair of Italian carved female blackamoor candelabras that each stand in at nearly 8 feet tall. I hope the photos do this stunning pair some justice, they are certainly more impressive in the flesh. 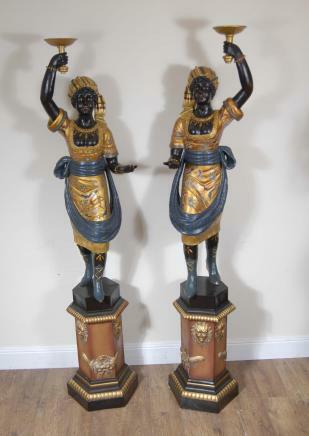 The details are exquisite, these really are a lavish pair ready to add style and elegance to any interior. The figures are hand painted in luxurious colours, gold for the dress, the red pedestal base and the black for the skin tones. The brush work is very intricate, definitely the work of a steady and skilled hand. The details on the carved sections are also very intricate, inluding the sun heads to the base, beaded edges and of course the figures themselves, particulary features like the drape to the dress and their marvellous facial expressions. They are both offered in great shape ready for home display right away and we will ship to anywhere in the world. We bought these from a dealer in Kensington and they are originally from Italy.